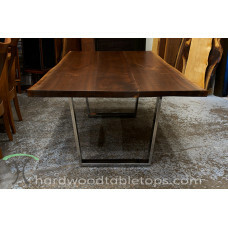 We offer solid hardwood live edge slab tables in kiln dried rescued Walnut and other hardwoods. Our live edge tables and tops are at home in nearly any decor style while our rectangular slab table designs will enhance transitional, Mid Century Modern, contemporary, rustic and eclectic design motifs. Our tables are available with heirloom quality solid hardwood legs in our Mid Century Modern influenced designs or with coated steel and stainless legs in a variety of styles for a more transitional, urban, cottage or industrial look. 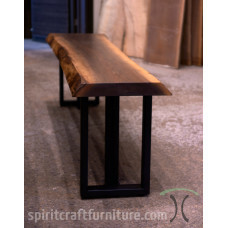 Our tables are handcrafted in our East Dundee, Illinois from live-edge hardwoods that we dry in our on-site kiln. Our table tops, live edge tables and island top are finished in our proprietary low VOC finish and are crafted to endure generations. we have been handcrafting heirloom quality live edge tables since before it was a "thing"
Before investing in a live edge Walnut or hardwood slab table, read this article concerning the importance using kiln dried hardwoods. Why Choose Hardwood Table Tops for Your Custom Made Top?